The anterior cruciate ligament, or ACL, is one of the four main ligaments that support the knee. The ACL crosses the front of the knee diagonally, and provides support during rotation as well as keeping the tibia from sliding in front of the femur. 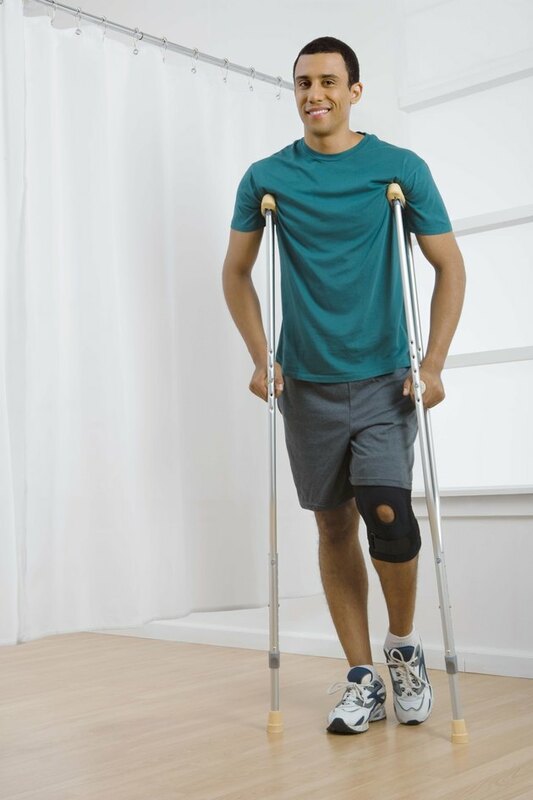 Once you have an ACL injury, you will lose leg strength and motion, according to Cigna.com, and an exercise program is necessary to regain your previous level of physical fitness. Don't exercise with a torn ACL unless you have the approval of your doctor. The ACL is the most commonly injured knee ligament, according to the American Academy of Orthopedic Surgeons. Sports such as basketball, football, soccer and skiing increase the risk of ACL injury. Symptoms of an ACL injury include pain, extensive knee swelling, a feeling of instability in the knee and loss of range of motion. If the ACL is partially torn, rest and rehabilitation may resolve the problem within a few months, but a complete tear of the ACL can make the knee so unstable that surgery is necessary. There are two issues related to staying in shape with a torn ACL: The first is regaining strength and flexibility in the knee, while the second is maintaining or regaining cardiovascular fitness. Since the ACL provides stability to the knee, you will probably find that you cannot participate in sports that require you to run, jump or pivot. However, you may be able to exercise with a knee brace to provide the stability your knee lacks after a torn ACL. Some of the exercises that are used to regain strength and function in the injured leg after an ACL injury are heel slides, leg lifts, glute sets, bridges, heel raises and mini squats against a wall. The thigh muscle, or quadriceps, is particularly likely to become weak after an ACL injury, according to Cigna.com. Quad sets and straight leg raises can help strengthen the quadriceps. All of these exercises should be done slowly and should not cause pain. Range of motion exercises are usually initiated as soon as the swelling and pain allow -- within the first few days after an injury. Although you may not be able to run, when your doctor says it's all right -- anywhere from a few days to a few weeks after your injury -- you can resume other forms of aerobic exercise. Swimming is one form of aerobic exercise that does not require weight bearing, and you may find that you are able to swim once the initial pain and swelling of a torn ACL subside. Rowing is another aerobic exercise that may be possible with a torn ACL. You may also be able to use an elliptical machine or a stationary cycle. If you feel pain in the knee when you exercise, stop and consult your doctor.